Do you have 20 used postal stamps or even collect them? Then this is the swap for you ! Please send post stamps with paper backings or even cut out onto the envelope they are on. You can peel them off though, and then glue them onto paper or card stock and cut them out nicely individually. 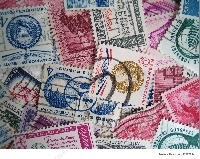 You will send 20 used post stamps to one partner. I will assign partners on Thursday Morning and you will have until the End of Saturday to send out your envelopes! Please remember to add a small note with your username and name of the swap when sending out your stamps!